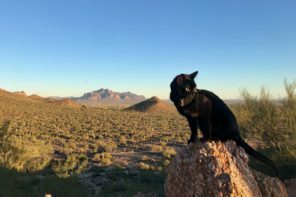 When it comes to living nine lives to the fullest, one cat stands out to us as an inspiration: Zhiro, the tenacious rescue who doesn’t let her physical disability keep her from taking on the world — one rock at a time. 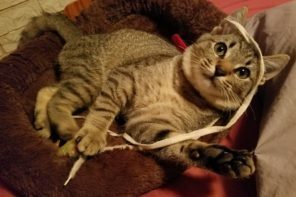 Born with cerebellar hypoplasia, a neurological condition that causes walking and balance problems, Zhiro isn’t able to get around as easily as other cats, but Zhiro’s human, Lacy Taylor, says it certainly hasn’t slowed her kitty down. Adventure Cats: When did you adopt Zhiro, and how did you find her? Lacy Taylor: It is a funny story how we found her. I went running early around 4 a.m. and had heard some crying when I left but didn’t think much of it. When I finished, I heard the sound again and decided to follow it. There is a little cubby in the place we were renting, and I got a flashlight and found a small white kitten about 4 feet under the house. I tried to get her out with food. I tried using a long stick to balance her on as well, but nothing worked. I ran inside the house to wake my boyfriend to ask for advice, and he said to try spraying water in there. I didn’t want to do that so I tried using the stick again. After many failed attempts, I ended up spraying the hose into the cubby and the kitten came running out. I brought her inside, and it took her probably a week before she started to feel comfortable around us. I let my boyfriend name her Zhiro, after a Hutt from “Star Wars.” We brought her to the vet and found out she was around 3 weeks old and had cat cerebral palsy. It was mild, but she had a difficult time as a kitten walking. She is much better, being just over a year old now. When did she start accompanying you on your outdoor excursions? Zhiro was around 6 months old when we started bringing her outside with us. We noticed how eager she was to go outside when every time we came home she would be waiting at the door. Since we were going to California and then Red Rock, Nevada, for Christmas, we decided to bring her along on the trip. What kind of trips does she join you on? 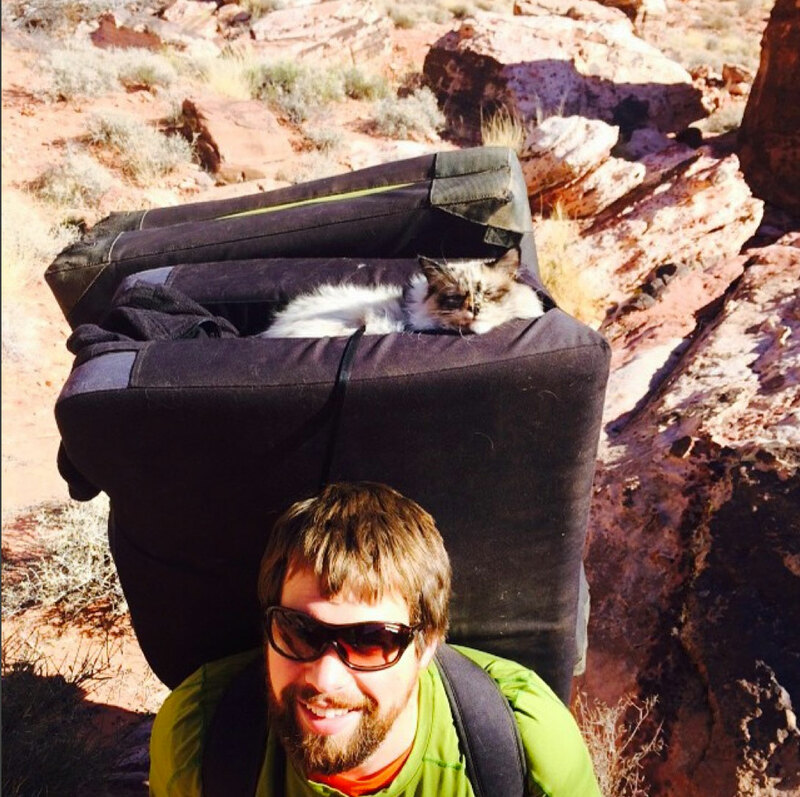 Zhiro accompanies us on climbing trips. 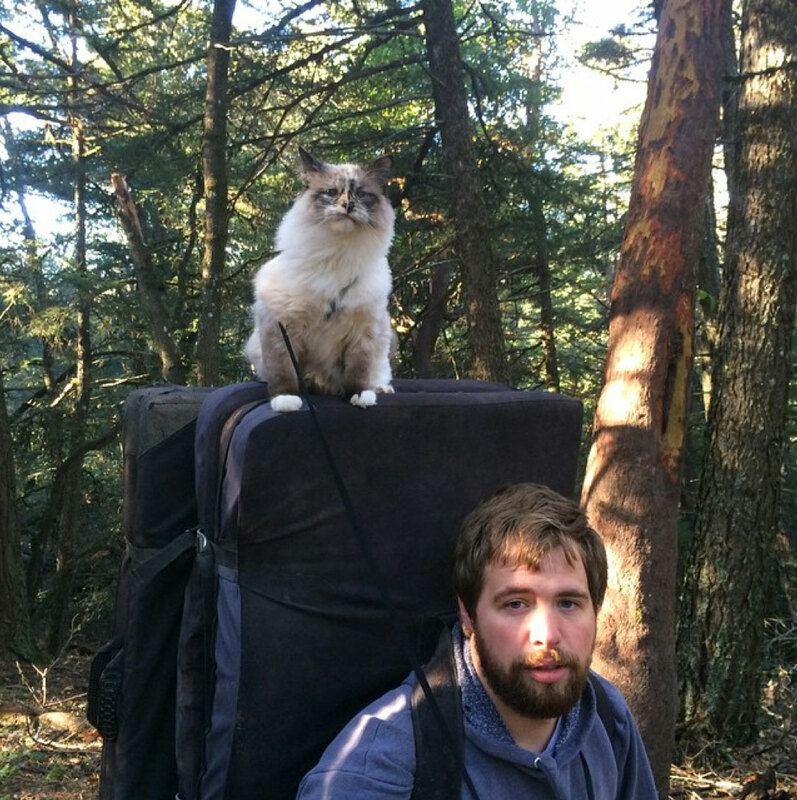 She prefers to be carried on our crash pads while we hike to the climbs. She will occasionally walk on her own, but she does not like to stick to the trails. What’s a typical excursion like for you? A typical excursion with Zhiro starts with the car ride. For the first hour or so she runs around the car trying to look outside the whole time. Then she finally wears herself out and sleeps on our lap for the remaining time. 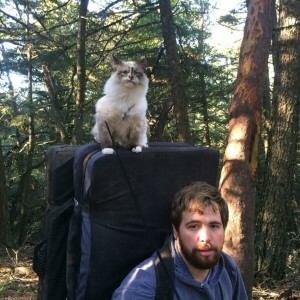 Once we arrive, we typically have to hike a bit so we put Zhiro on top of the crash pads and start hiking in. 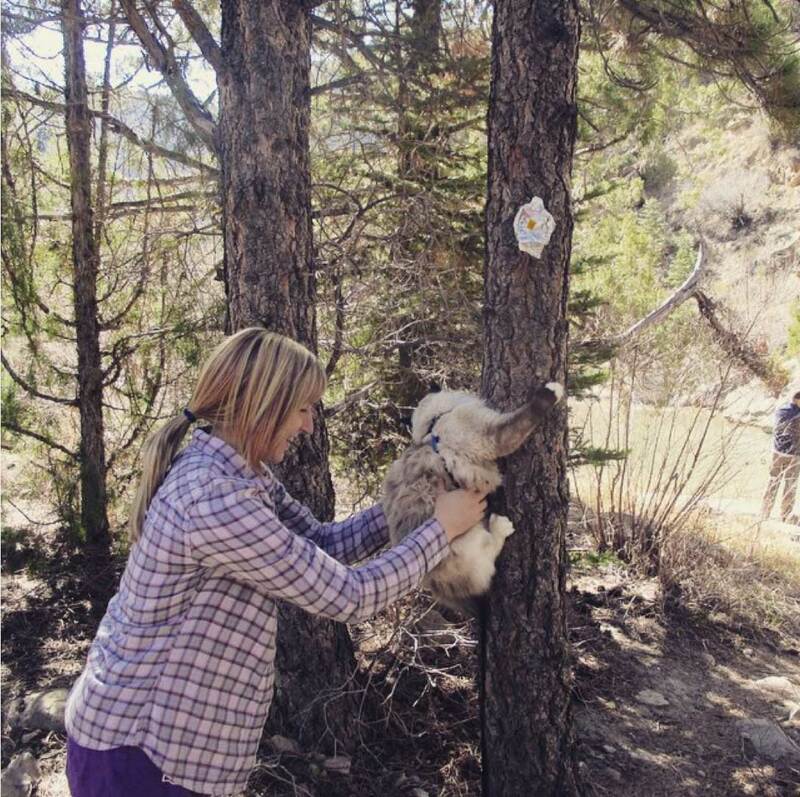 When we reach our climbing destination, we let her explore a bit, letting her pull us along on the leash to go wherever she wants. 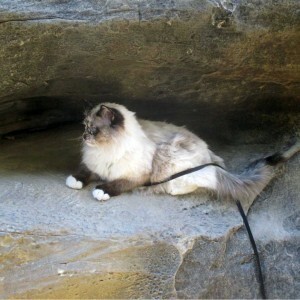 Then we bring her to our climb where she settles in a cool area and relaxes. Seven years previously I had found two kittens underneath my car and kept them. We have both always wanted a dog as well, but we just don’t have the space and the means for one. Instead, we decided to treat Zhiro as both a cat and a dog. Being an adventurous cat and “walking her” outside has given us the best of both worlds. We can have a furry companion to lounge with at home and to join us on our outdoor excursions. However, there are downfalls. As a cat she doesn’t prefer to use the outdoors to go to bathroom. Instead, we have to bring kitty litter with us camping. Also, we do not feel comfortable taking her off a leash to roam around on her own like many dog owners do. What’s one of your favorite memories with Zhiro? My favorite memory with Zhiro was when we went car camping. We had set up a blow-up mattress with flannel sheets, and she just went crazy for the feel of the flannel. She was prancing around, wobbling on the air mattress, purring all night. It was adorable. Where has Zhiro accompanied you? We have brought Zhiro climbing with us to the following places multiple times: Castle Rocks, California; Castle Rocks, Idaho; Red Rock, Nevada; Little Cottonwood, Utah; and Joe’s Valley, Utah. 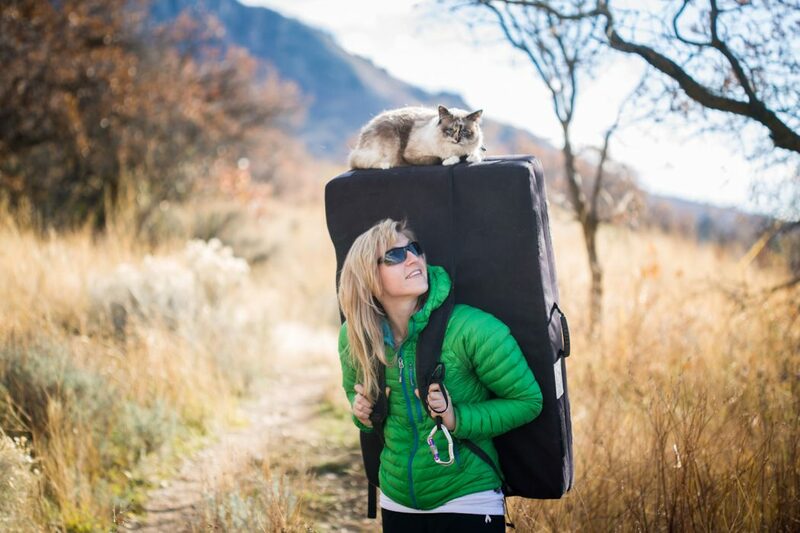 What advice do you have for people who are considering taking their cats into the great outdoors? I by no means am an expert, but I typically try to come over prepared. I bring her cat food, but I also bring treats or tuna in case she is being difficult eating outdoors. She will never deny tuna. I also make sure to bring tons of water and continually check her paw pads and nose to make sure she is not overheating. I feel it is really hard to tell what cats are thinking or wanting at times, and therefore I am always checking on her to make sure she is comfortable throughout the day with water, food, shade and so on. Because of Zhiro’s disorder, we were told she would not be able to jump, but instead she would be a climber. We knew she would be the perfect fit for us since we identify as climbers ourselves. She has been able to jump a few feet at times (nothing compared to what my other cats jump), but typically we make sure cloth is available so she can climb up onto the couch and the bed. 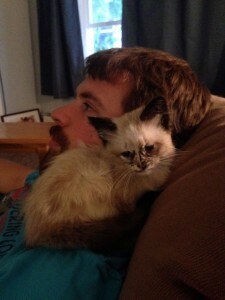 We were really glad we found her and took her in. Even though she became our daunting third cat, we have never regretted it. See more of Lacy and Zhiro’s adventures on Instagram. All photos are courtesy of Lacy Taylor. LOVE this! 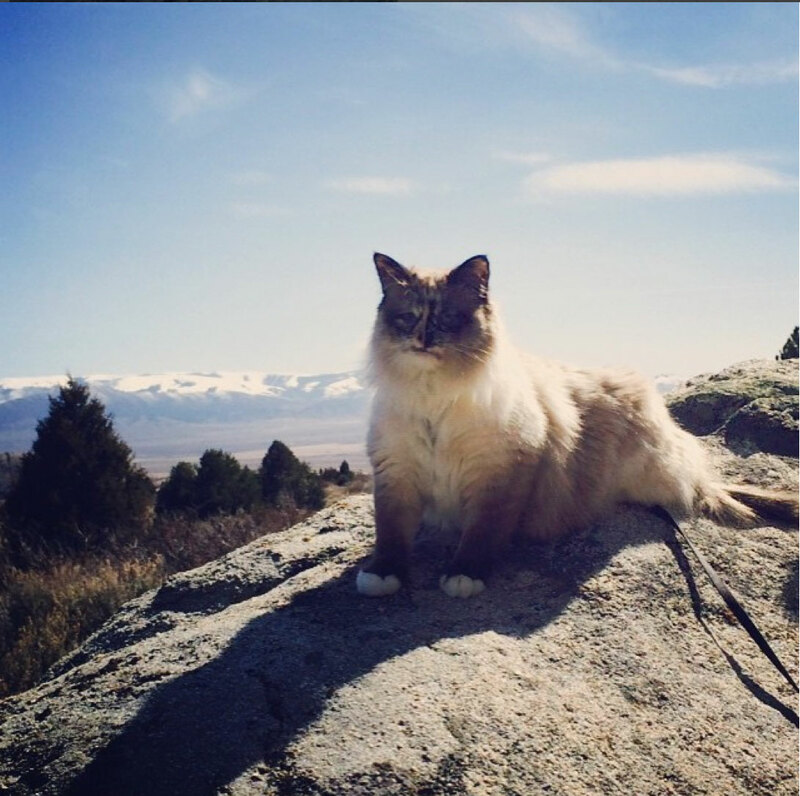 I too have a cat with cerebellar hypoplasia who goes on outdoor adventures with us. She has been to outdoor concerts, on hikes, and she’s even been camping. Like Zhiro, she can’t jump much, but she LOVES to climb. CH kitties are AWESOME!! Thank you for sharing about Zhiro!